This leaf is from a French Book of Hours made in the middle of the fifteenth century. It measures only 18 x 13.5 cm, and its broad margins help emphasize the often dramatic difference between the size of a text block and the overall size of a leaf. The text block is ruled in red; first letters are decorated with gold, blue, light plum, and white. The ivy leaves are gold, with flowers and buds in the ivy rendered in medium green and blue, and occasionally red and plum. Some leaves have the marginal ivy on both the recto and verso. See Denison University Leaf 29 for more information about this manuscript. 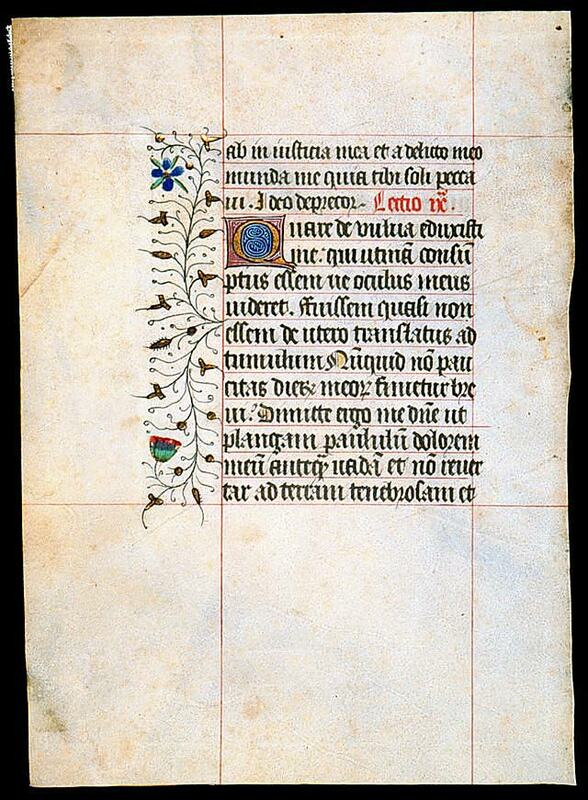 Text: Based on the leaves we have seen, this Book of Hours accords with the Use of Rome. This leaf contains text from the Office for the Dead, Matins, the Third Nocturne, including passages from Job 10. A scan of the recto is currently unavailable. Reconstruction Note! In Ege's original manuscript, this leaf followed what is now Leaf 29 in the Ohio University portfolio. ab in iusticia mea et a delicto meo munda me quia tibi soli peccavi. Ideo deprecor. Lectio 9. [3 lines untranslated.] Lesson 9.